The end of the scapula that forms a joint with the humerus. The collarbone, which connects the shoulder to the sternum. The roof of the shoulder that is formed by the scapula. The thick hook-like bony protrusion attached to the front of the scapula. The rubbery, slippery substance that covers the ends of bones at the joint. Healthy cartilage enables smooth joint movement and absorbs shock. In the shoulder, articular cartilage covers the end of the humerus and lines the socket of the glenoid. The loose ball-and-socket joint at the shoulder where the humerus articulates with the glenoid region of the scapula. The joint where the clavicle articulates—or joins—with the acromion. The joint where the clavicle and sternum meet, connecting the arms and shoulders to the main skeleton. The so-called “false joint” where the scapula passes over the ribcage. Rather than having ligament attachments like true joints, it is held in place by bones, bursae and muscles. The lip-like cartilage that encircles the edge of the glenoid, enabling it to provide a deeper cup for the glenohumeral joint. Also the site of attachment between the biceps tendon and the glenoid. 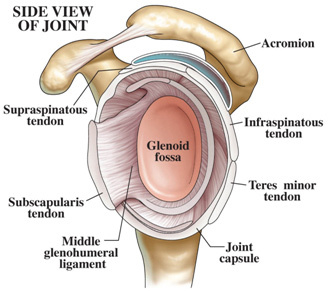 The fibrous sac surrounding the glenohumeral joint formed by ligaments. The tendon that attaches the biceps muscle of the upper arm to the shoulder’s glenoid, becoming part of the labrum. The tendon that attaches the triceps muscle of the upper arm to the scapula below the glenoid. Four tendons that connect the supraspinatus, infraspinatus, teres minor and subscapularis shoulder muscles to the humerus. The supraspinatus, infraspinatus, teres minor and subscapularis muscles that enable the shoulder to rotate within the ball-and-socket joint a full 360 degrees. The strongest muscle located on the outer layer of shoulder that enables the arm to be lifted away from the side. The muscle originating at the shoulder and running down the front of the upper arm that serves to stabilize the humerus in the glenohumeral socket and contributes to elbow flexion. The muscle originating at the shoulder and running down the back of the upper arm that is primarily responsible for elbow extension. 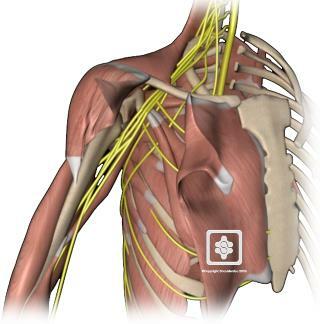 The axillary nerve originates from the posterior cord of the brachial plexus. 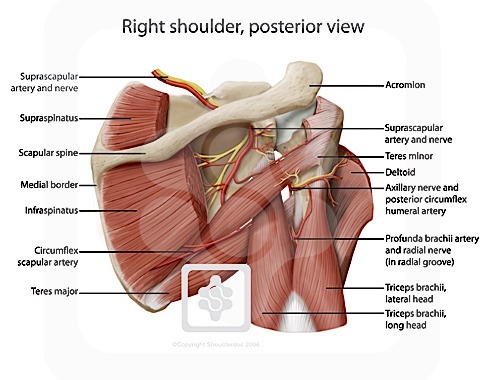 It passes through the quadrilateral space under the teres minor, which it innervates, before sending branches to the deltoid muscle and the lateral skin of the shoulder. The main artery that brings oxygenated blood into the axilla (armpit) and upper arm before becoming the brachial artery.